The round tiers are sized as follows, 6", 10", 14", 18", and 22". 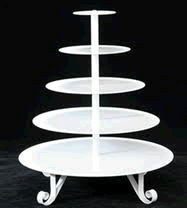 The stand adds height and interest to every buffet presentation. It is 30 pounds. It holds approx. 130-150 varying in size. It stands at 25"-26" tall. * Please call us for any questions on our cupcake stand 5 tier white rentals in Cornelius NC, Lake Norman, Mooresville, & Davidson, North Carolina.